Avid fans of Game of Thrones know that the show is always packed with tons of (often delightful though sometimes tragic) surprises. 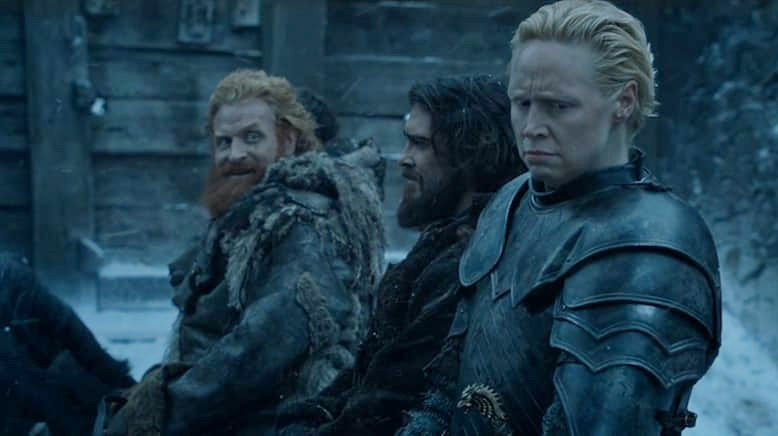 But so far, nothing this season has been a bigger or more delightful surprise than the out-of-the-blue love story between Tormund Giantsbane and Brienne of Tarth. When Tormund first laid eyes on Brienne at The Wall, it was like Romeo seeing Juliet at the party and knowing it was true love at first sight. A unpredictable wildling and a proud lady knight would certainly be star-crossed lovers (not to mention a possible perfect match). So like Romeo and Juliet, it’s shaping up to be a love story for the ages (just hopefully, you know, without all the tragedy). Fans have been going crazy about the possibilities of this relationship. And as it turns out, the actors have been totally feeling it as well. He even goes onto say that part of the fun of the attraction is the fact that Brienne (at least so far) has not reciprocated his feelings. We all know Tormund likes a challenge. And nothing is more challenging than a woman who not only shows no interest in him, but also can (literally) fight a friggin’ bear. Basically, they’re a match made in heaven and we how love the rom-com style tension between them provides a nice reprieve from a lot of the other often dark stuff that happens in the Seven Kingdoms.